All fighters took home an extra $50,000. The co-main event featured a bout between Tibau and Hallmann that left fans on the edge of their seats until the judges’ scorecard was read. Tibau opened the first round off with a combination that would have knocked Hallmann out if it had landed. From that moment on, it was all about positioning and strategy. Tibau was able to utilize his strength to maintain advantageous positions until he eked out a deserved, albeit close, decision victory. Was this bonus a surprise? 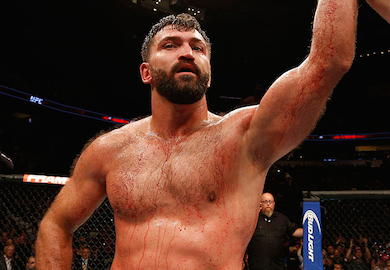 Andrei Arlovski capped the night off with one of the most brutal finishes in recent memory as he knocked “Bigfoot” out cold with a beautiful combination. Silva got rocked with two right hooks and collapsed to the canvas, but it looked like he had recovered just fine. Arlovski jumped right into side guard where he proceeded to drop hammerfists until Silva was clearly out cold. The referee called the fight off for Silva’s safety, but the damage had been done; Silva was out cold for minutes after the fight stopped. Dashon Johnson was on his way to an impressive performance on the preliminary portion of the card, but Pepey cut him off and picked up an impressive submission victory. Johnson slammed Pepey onto the canvas and it looked as if Pepey’s head bounced off the mat. Pepey was unfazed by the slam and continued to work for a submission off his back. He got Johnson in a triangle choke, but transitioned to an armbar while still trapping Johnson in the triangle position. Johnson had nowhere to go and was forced to submit in the first round.